Ankle arthritis, a form of osteoarthritis, is a degenerative condition in which the articular cartilage of the ankle joint wears thin and eventually breaks down. You may feel pain, swelling and stiffness in the joint. Trauma. A previous sprain or fracture can leave the ankle more prone to arthritis. An ankle that has been subject to some sort of trauma is around 7 times more likely to develop arthritis. As many as 80% of cases of ankle arthritis can be classified as “post-trauma arthritis.” Although the original ankle fracture or sprain may have healed, physiological changes can take place in the ankle to compensate for the injury, resulting in osteoarthritis several years down the road. Underlying Medical Condition. Between 10-15% of cases of ankle arthritis are caused by an underlying medical condition, such as rheumatoid arthritis, congenital structural defects, blood disorders, and conditions that cause poor circulation. Although many aging adults dismiss the pain as another sign of “old age,” or of an old ankle injury “acting up,” it’s important to seek help for chronic ankle pain. There are a number of treatments that can slow the progress of ankle arthritis, relieve pain, and keep patients on their feet. Pain in the ankle, lower shin, mid-foot, and/or rearfoot, and can be dull or acute, chronic or intermittent. Joint pain after daily activity. Walking or jogging can cause pain and swelling in the joint. Swelling. As the cartilage wears thin, friction caused by regular ankle motion irritates the joint, causing swelling and discomfort. Stiffness. The increased friction between bones can stiffen the joint, making simple foot functions like pointing and flexing the toes more difficult. The stiffness tends to worsen after long periods of inactivity. Arthritis can be diagnosed with a full medical history, a physical exam, and advanced imaging technology. Your physician will examine your ankle for swelling, tenderness, joint damage, bone spurs, and a loss of range of motion. Although an X-ray can reveal signs of joint damage, it is not the most reliable indicator of osteoarthritis. However, it can aid in making a diagnosis along with a physical examination. An MRI (magnetic resonance imaging) can provide a more complete picture of the location and degree of cartilage loss. Arthrocentesis. In this procedure, a sample of joint fluid is extracted through a needle. The fluid is then tested to rule out other conditions. The pedCAT is a weight-bearing CT scanning machine that produces a 3D image and allows your specialist to identify points of stress on your ankle while standing. UFAI is one of only a handful of clinics in California with pedCAT technology. The goal of ankle arthritis treatment is to keep motion in the joint and provide long term pain relief using the least invasive option possible. Non operative treatment options can sometimes “buy time” for our younger patients and then treat the ankle with a more invasive option in the future. Usually effective in low-grade cases, custom orthotics can control some of the motion at and below the ankle that may remove some of the stresses that are being put on the ankle joint. Custom bases that cross the ankle joint can be very effective. These limit the amount of motion of the joint; less motion can lead to less pain. These braces can be hinged to allow for some movement, or unhinged to allow for no movement. Regenerative medicine prompts the body to heals itself and offers many patients the best chance at improving long term ankle function and joint restoration. At UFAI, we perform either stem cell therapy or platelet-rich plasma therapy, or a combination of both. Both therapies are minimally-invasive and can be used as an alternative or addition to surgery. Patients who have stem cell injections use their own cells to regenerate their tissue by getting the body to repair itself. The tem cells replicate themselves and nearby cells start to mimic them prompting healing as well as producing an anti-inflammatory effect that can help reduce pain. Stem cells injections also contain hyaluronic acid, which lubricates joints and tendons, further easing pain and helping restore mobility. Regenerative medicine is not a steroid injection. Corticosteroids suppress the body’s immune response, which is why steroid injections mixed with anesthetic can be used to reduce inflammation and pain in arthritic joints. However, this relief is typically short-lived and need to be re-administered every 3-4 months. Long-term steroid use can further weaken the cartilage and soft tissue. This procedure cleans up the ankle joint, debriding scar tissue, damaged cartilage, loose cartilage, bone fragments, and bone spurs, allowing for restored mobility and decreased pain for your active life. It is generally performed on an outpatient basis. Ankle arthroscopy is performed through two or three tiny incisions on the ankle. The surgeon inserts tools and removes tissue through the slits, guided by a lighted camera. Stem cells therapy can be used in conjunction with ankle surgery to speed up the recovery process. Often effective for severe arthritis, arthrodiastasis is distraction of the ankle joint by use of an external fixator that allows the joint to repair itself. Arthrodiastasis is sometimes done in combination with ankle arthroscopy to clean out the joint and stem cell therapy to help produce healthy tissue. Choosing the best arthroplasty implant design for each patient is the first step towards a successful outcome. Our surgeons have extensive experience in all three types of ankle replacement surgery. This allows us to customize treatment and do what is best for each patient. Ankle fusion is considered a joint-destructive procedure, meaning the patient will no longer have mobility in the joint. While this may sound extreme, patients with end-stage arthritis generally have already lost almost all ankle motion before treatment. Fusion can provide the ankle with stability and significantly reduce arthritis pain by immobilizing the joint. When you choose the University Foot and Ankle Institute, you can rest assure that you have chosen a compassionate team of experts with decades of combined experience. Out team of physicians use state-of-the-art equipment, work directly with medical manufacturers to develop new technologies are one of the few foot and ankle practices in the nation that offer the latest treatment options for all stages of ankle arthritis. Can Waiting to See a Foot Doctor Today about a Bad Ankle Bring Arthritis Tomorrow? YES! The One Surprising Cause of Arthritis – Ladies, Listen Up! 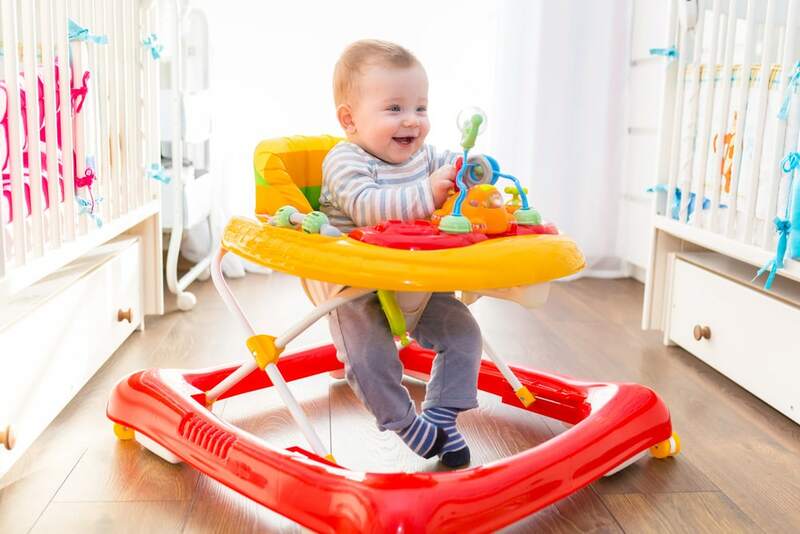 Are Baby Walkers and Jumpers a Hindrance in Learning to Walk? Apparently so.